Want to get away? Fun places to go (without going too far). Hot Hundred cycling event draws hundreds of riders. OUT ON A HIGH NOTE Miracle League of Tuscaloosa wraps up its spring season. ville State University in emergency management. Smith’s predecessor, Chief Alan Martin, announced his retirement in January after serving in the position since 2002 and in the fire service for over four decades. him, and now I pay him a weekly allowance to keep up with chores. He is doing great with this and I am so happy to have less to do when I get home!” For those of us with sweet little people who aren’t old enough to grow into that independence we are all looking forward to, here are a few tips for working moms: 1. Make a routine out of no routine. While I am a firm believer in children using their imaginations, dressing up and playing make believe, I am also a firm believer in growth. While I know “organized” chaos may occur while I’m at work and the boys are at home, I make sure that my son and I visit the library each week and participate in the education-related activities that our time allows. I also make it a point to get with like-minded moms once or twice a week for casual play dates. 2. Throw a little school work in the mix. At age five, my Little loves science. Typically, I buy study workbooks for the next age group ahead to keep up with the things he’s learned in school and the things I’d like him to learn next. For the summer months, I’ve taken the time to research quick and fun science experiments for us to perform during those rainy Saturdays, or an otherwise slow-paced Monday evening. and he entertained himself. Kudos, kid! This is awesome and quite entertaining! 4. Don’t feel guilty. Your child has been in school for months, and deviating from routine is good for them. You know those days when you’re just super tired and feel the need to kick off your pumps and hit the sofa? Sometimes our kids need to do that too. You’re doing great, mom. Take a chill pill. Marlena Rice is a busy mom and writer who lives in Tuscaloosa with her husband, Rod, Local mom Marie Watts Faile enjoys some outdoor time with her son, Wesley. Photo: Marie Watts Faile and their son, Beaux William. Check out her blog at heartfullybuilt.com. that bush was that I stood in front of so long ago. On Mother’s Day, I talked to my dad, Tom. He’s another story. His body was great until 72. Alcohol corrupted his brain, and after a series of health issues, he now lives in a nursing home a few hours away. Yes, the man who was to die 10 years ago of liver failure is on autopilot, and he will outlive us all. I was surprised when he called. I made small talk. I told him about his grandson who was following in his musical footsteps. And in his non-delicate way, he interrupted. “Yeah, baby, I need to stay on course or I’ll forget why I called. Happy Mother’s Day. Now, do you still have my mother’s number? I seem to have forgotten it.” His mother is 103 and lives in Rhode Island. I spoke to her on her birthday in March. She is still an amazingly clear-headed and kind-hearted woman. Clara was my rock. Tom was just living the rock-and-roll lifestyle until everything ran out on him. Two people who lived their moments and took their steps in remarkably opposite ways. This is your day. Make your steps count for yourself, and nurture those around you. Remember that they, too, are deciding how best to use their steps. Blessings, Allison Allison Adams is a mom of four and a Realtor with Lake Homes Realty serving Lake Tuscaloosa. For comments, email aadams@lakehomes.com. The Excellence Award is given to employees who exemplify the highest standards of excellence in attitude, job performance, dependability, appearance, and contributions to DCH beyond the call of duty. 5 Andrew Tomes is NorthRiver Yacht Club’s new director of golf. Tomes, a native of Manchester, Tennessee, has been at NorthRiver since 2016, serving as the club’s head golf pro. of the DCH Health System and administrator of Northport Medical Center, was recently named chair-elect of the Alabama Hospital Association (AlaHA). The election was made at the Association’s annual meeting. News and Happenings 1 Ed Hutchins Hutchins, an analyst who works in Information Technology at the DCH Health System, has been named a recipient of the DCH Excellence Award. Hutchins joined DCH in June 2015. 4 Monkey Joe’s Joe’s, the Tuscaloosa children’s entertainment center which opened in September 2015, closed its doors on July 1. The property, which is owned by the University of Alabama, will be used for a new traﬃc bridge to support safe access to the campus and DCH. 6 The Nucor Technical Academy’s 5th freshman class is filling up quickly. The Academy oﬀers essential coursework and extensive handson training. For more information, contact Justin Knight at Justin.Knight@nucor.com or visit Nucor. com. 7 After 91 years in business, Tuscaloosa’s Union Furniture Co. was expected to close its doors this month. Established in 1927, Union Furniture was one of the state’s oldest and largest independent furniture dealers. Anniversaries 1 The Barre Code Tuscaloosa (2700 University Blvd. ), a fitness studio for women, will celebrate its one-year anniversary later this month. 3 Kentuck has a new marketing manager. Ashley Williams is a recent University of Alabama graduate with a longtime love of the arts. She is a former Kentuck Art Center intern. 2 Innisfree Irish Pub in Tuscaloosa celebrated its 20th anniversary in Tuscaloosa on June 2 with live music, drink specials, crawfish, and special giveaways. nated rest stops will be available to riders at predetermined intervals of every route. Midway through the longest rides, the Hot Hundred riders will be provided with a meal donated by Northport Chick-fil-a. their materials on the day of the race. Through donations from sponsors, the Hot Hundred annually hosts Wounded Warriors from Fort Benning, Fort Gordon, and Fort Stewart. Not only do they ride for free, but they also stay at Hampton Inn both Friday and Saturday night at no cost. To learn more about the Hot Hundred, or to sign up to ride, visit bikehothundred.com. Miracle League of Tuscaloosa Ends Spring Season on a High Note The Miracle League of Tuscaloosa wrapped up its spring season on May 19 in a major way, with a slew of games, and a big celebration at The LeeAnna Grace Cunningham Field at Sokol Park North. This season was particularly special for the organization, as the games were played on a newly resurfaced field. The eight-year-old rubber field the League uses for children and adults with special needs to play baseball was replaced earlier this year, thanks to generous community donations. The new surface was revealed on opening day, April 7. “Thanks to the generous outpouring of our community, our players were able to have a blast playing on the new field surface without having to worry about safety concerns,” said Kathryn Taylor, the marketing director for Miracle League of Tuscaloosa. The final game day of the spring season was a special treat for players. The Elk’s Lodge of Tuscaloosa (Elks 393) sponsored the day by providing food for the players. Treats for the players were also provided by Sno To Go. In addition, the players were able to enjoy a petting zoo from H&H Farms and face painting by Heather Payne. The joy of the day was captured by Terri Lane of Terri Lane Photography, who took over 1000 photos of the games and events free of charge. “I feel like this was one of the best spring seasons the Miracle League of Tuscaloosa has ever had,” Taylor said. “We are already looking forward to the fall season!” Approximately 120 players and their families play ball with the Miracle League of Tuscaloosa. To learn more about the organization, visit miracleleagueoftuscaloosa.com. tritionists specifically for cancer patients. Vouchers can be redeemed for the healthy ingredients they need at the University Boulevard Piggly Wiggly location. Since the very first year, Mr. Pig Goes to the Zone has received an outpouring of support from the Tuscaloosa community that will help keep Jimmy Welborn’s legacy alive for many more years to come. “My Dad was a good person,” Welborn said. “He cared about people. He truly had a heart for serving others.” Tickets are available for purchase at the door, local Piggly Wiggly locations, and online at eventbrite.com/e/mr-pig-goes-tothe-zone-tickets-47152235606. William March was a World Nell, a frustrated young writer, War I Marine veteran who attendstruggled with her novel. She was ed Law School at the University. working with multiple versions He is best remembered for his and felt it was disjointed and book The Bad Seed, which was episodic. The stress had become released as a movie in 1956 and more than she could bear. She subsequently nominated for four opened a window and hurled Academy Awards. March authored the manuscript, Atticus, into the numerous other books, including darkness. The pages fluttered and Company K, regarded by many as settled onto the dirty snow. It was one of the greatest literary works to the winter of 1958 in New York arise from the first World War and City. the equal of Erich Remarque’s All In desperation, Nell called her Quiet on the Western Front. British editor at Lippincott. He told her journalist Alistair Cooke regarded to go outside and pick it up. The March as “the unrecognized genius young writer’s full name was Nell of our time.” Harper Lee. She went on to finish William Bradford Huie graduather novel and changed the title. To ed from the University in 1930. He Kill a Mockingbird was published authored numerous works which on July 11, 1960. It became an became movies but is perhaps best instant bestseller—winning the remembered for The American1961 Pulitzer Prize for Fiction. ization of Emily, released in 1964. Eventually, over 30 million copies The lead actors, Julie Andrews and were sold, and it was translated James Garner, considered their into more than 40 languages. characters to be the favorite roles To Kill a Mockingbird is one of of their lengthy careers. The Klansseveral novels whose authors have man was released in 1974 and strong connections to Tuscalostarred Lee Marvin and Richard Burton. osa—all are University of Alabama Some of the other movies adapted from alumni. Additionally, some of these Huie’s work include The Outsider, The books became major motion pictures. Revolt of Mamie Stover, and Wild River. Released in 1962, To Kill a MockThese novels, and their subsequent ingbird starred Gregory Peck as Attimovie versions, were written and cus Finch, a fictionalized version of filmed over a period of half a century. Lee’s father, attorney Amasa Coleman However, they tell stories of people Lee, and two unknown child actors, behaving in extraordinary ways in Mary Badham and Phillip Alford. The extraordinary circumstances. Although main themes of the book and movie the authors, characters, and settings are the coming of age of three children might be described as “regional,” their in a small town and prejudice and inappeal and success have been national justice. The movie won three Academy and international. Awards, including Best Art Direction, Adapted Screenplay, and Peck as Best Actor. In later years, The American Film Institute named To Kill a Mockingbird one of the greatest movies of all time. Mark Childress, like Harper Lee, was born in Monroeville, Alabama. Childress worked initially as a reporter and a magazine and newspaper editor. In 1984, A World Made of Fire became the first of several novels. His Top: President George Bush with Harper Lee at the 2007 Medal of Freedom Awards Ceremony. Bottom: Book covers and movies posters of works by authors with connections to Tuscaloosa. Images courtesy of Wikimedia Commons. fourth novel, Crazy in Alabama, was About the Author an international best seller and won The movie version starred Tom Hanks As a movie, The Help was a huge fi nanJim Ezell is a retired engineer, hisnumerous awards. In 1999, the movie as the title character and was directed by cial and critical success. It opened on Autorian, and author. His newest novel, The version of Crazy in Alabama was released, Robert Zemeckis. It was released on July 6, gust 10, 2011, and within months grossed Cistern, was published in Dec. 2017. The starring Melanie Griﬃn and directed by 1994, and was an instant hit. It became the over $200 million—against a production Cistern is an adventure/crime novel set in Antonio Banderas. The basic plot concerns cost of $25 million. The Help was nomiTuscaloosa and fictional Tombigbee Couna woman who heads for California with her fourth highest grossing movie in history— taking in over $600 million. It received 13 nated for three Academy Awards, including ty in the Alabama Black Belt. The Cistern abusive husband’s head in a box while her Academy Award nominations and won six, Best Picture. Octavia Spencer, a native of is available on Amazon.com. nephew back in Alabama must deal with a including Best Film, Best Actor, and Best Montgomery, won the Best Supporting racially motivated murder. The movie was Director. The film has been recognized as Actress Award. an oﬃcial selection at the Venice and San a landmark in movie technology for its Fannie Flagg is a character actor and Sebastian Film Festivals of 1999. special eff ects. writer who attended the University in 1962. Like Mark Childress, Winston Groom It took Mississippi native Kathryn Born Patricia Neal (no relation to the actor began his writing career as a reporter. His Stockett fi ve years to complete her fi rst of the same name) in Birmingham, she first novel, Better Times Than These, was novel The Help, which was subsequently appeared in numerous movie and television published in 1978. His fifth novel, Forrest rejected by 60 literary agents. It was finally productions but is best known for her 1988 Gump, was not a best seller until it was published in 2009 and spent 100 weeks on book, Fried Green Tomatoes at the Whistle adapted into a movie. It then sold nearly The New York Times Best Seller List. The Stop Café, which in 1991 was released two million copies. The basic story depicts plot centers upon a young white woman as the movie Fried Green Tomatoes. It several decades in the life of an intellectuand her relationship with her two black was critically acclaimed and received two ally challenged Alabamian who witnesses maids during the Civil Rights era in JackAcademy Award nominations. and participates in some of the defining son, Mississippi. events of the late twentieth century. Take advantage of the endless opportunities available with OLLI@UA membership. You’ll stay mentally and physically active with a variety of social, educational and travel options. Learn more about OLLI membership benefits, courses and field trips at our next open house. August 30, 2018, 5-6 p.m.
Bryant Conference Center • 240 Paul W. Bryant Drive Tuscaloosa, AL Questions? Visit olli.ua.edu or call 205-348-6482. A Five-Star Dinner in Birmingham Okay, mom and dad: If you are looking for a luxury, five-star dinner, you don’t have to go far. Schedule a sitter and head to Birmingham - home of The James Beard Foundation’s 2018 most outstanding restaurant. Highlands Bar & Grill is also home to the Foundation’s most outstanding pastry chef, Dolester Miles. Known for fresh, seasonal dishes made from regional ingredients, and fantastic service, the worst part will be deciding what not to order. After dinner, take a stroll through the Birmingham Botanical Gardens, or take in the art pieces at Kelly Ingram Park. Photo: Highlands Bar & Grill Above Left: Chef Frank Stitt and his wife, Pardis, own and run Highlands Bar & Grill. Above Right: Dolester Miles, Highlands’ award-winning pastry chef, holds her specialty coconut pecan cake. A Monroeville Literary Experience Fans of the literary classic To Kill a Mockingbird by Alabama native Harper Lee should head down to Monroeville for an experience that will bring the story to life. A walk around the historic small town, and visits to the local shops and galleries, will take you back to a slower time. The Monroe County Museum, located inside the old Monroe County Courthouse, takes you behind the scenes of Lee’s iconic book. The Courthouse itself was the backdrop for many of the scenes in the book. Visitors can also explore The Birdhouse Trail of structures built by locals that depict scenes from the novel. The Old Courthouse Museum Hours are Monday-Friday, 10 a.m.-4 p.m., and Saturdays, 10 a.m.-2 p.m. The Museum is closed on Sundays and most holidays. Admission is $5. Photo: Monroe County Museum The Old Monroe County Courthouse’s courtroom is the model for Harper Lee’s To Kill a Mockingbird. It was recreated on a Hollywood soundstage for the 1962 movie. Family Adventure at DeSoto Caverns For those looking to add a little family adventure to the summer, a day trip to DeSoto Caverns might be the answer. Located in Childersburg, DeSoto Cavern is the first recorded cavern on record, noted by President George Washington in 1796. Over the course of hundreds of years, the caverns have seen everyone from Native American Indians to Confederate soldiers. Since 1912, generations of the current family that owns the cavern have created a unique, lively experience for visitors of all ages. Adult tickets start at $24.99 and child tickets start at $19.99. Packages are available that include access to the many attractions, including paddle carts, water golf, and more. Single attraction tickets start at $4.99. Photo: DeSoto Caverns Known as “Alabama’s Big Cave,” DeSoto Caverns is a marvel, and a great way to spend a day exploring with the family. The Sandlot (1993) There are a lot of movies about baseball – but here’s fun movie about a baseball. It’s the summer of 1962, and young Scotty Smalls is new in town when he’s taken under the wing of some neighborhood boys. Their adventure begins when they try to retrieve a baseball, Jerry Roberts is a movie critic and movie fan who believes in Birth-Movies-Death. He is the historian for armchaircinema.com and allegedly signed armchairoscars.com, and he has a blog at overthinkingoscar.wordpress.com. by Babe Ruth, that Lonely, he meets the much older The Parent Trap (1961) gets knocked over a fence and into Dorothy (she’s 29!) who has just What’s a summer without a Disney the yard of a neighbor with a dog learned that her husband has been picture? After Incredibles 2, enjoy so feared that it’s known only as killed. What blossoms between this blast from the past classic fea“The Beast.” [Rated G] Hermie and Dorothy is not only turing Haley Mills as twin sisters understated but complicated in a who conspire to reunite their parSummer of ’42 (1971) very real way. [Rated PG] ent’s marriage. If your kids haven’t When you’re finished with the acseen this hilarious original film, tion pictures, here’s a romance film they should. [Rated G] you can’t resist – but it’s just for the grown-ups. During the summer of 1942, Hermie is untouched by the war taking place overseas. FRESH SQUEEZED LEMONADE • 1 cup fresh squeezed lemon juice (5-7 lemons) • 1 1/4 cup extra-fine sugar • 4 cups water, divided • 1 cup ice. Put lemon juice, sugar, ice, and 2 cups of water in a blender. Blend until smooth. Pour in pitcher, along with the remaining water. Stir. Serve over ice. you’re looking for a cool cocktail to enjoy, this rosemary gimlet is a classic. The rosemary simple syrup adds a wonderful flavor, and it’s oh so fragrant. Cheers, DCL readers! Bon appétit! Amy Poore is a Tuscaloosa mom, wife, and foodie. To see more of Amy’s delicious recipes, visit her blog, Poore Amy, at pooreamy.com. Photos by Amy Poore. In a small sauce pan, bring water and sugar to a boil, stirring until dissolved. Remove from heat, and place rosemary in sauce pan. Let sit for 1-2 hours, remove rosemary, and store in the refrigerator for up to 4 days. Sheena Gregg is a registered dietitian and local “Filipino Foodie.” Follow her adventures at www.afilipinofoodie.com. Photos are courtesy of Sheena Gregg. Food Network videos have nothing on Tuscaloosa. T-Town now has its very own amazing rolled ice cream store – and it’s just a stroll away, in downtown Tuscaloosa. Who says you have to go out of town to get a milkshake in a mason jar with a piece of cheese cake hanging off the side? Since 2017, Northport-based bakery Athena’s has been offering up monster milkshakes to customers. Located next to Ajian sushi restaurant, Frost Bite Tuscaloosa’s debut this summer not only features the beauty of rolled ice cream worthy of a social media viral video, but also the “wow” factor of liquid nitrogen ice cream. Patrons can watch in wonder as shop staff conduct the most delicious science experiment ever right before their eyes. Frost Bite Tuscaloosa staff are quick to tell you that the liquid ice cream base is made in house, giving your ice cream creation the extra “yum” factor. Trust me, I’ve tasted, and my “yum” factor was full throttle. With flavors like chocolate explosion, cookie monster, strawberry cheesecake, and salted caramel (just to name a few), you know that this dessert is worth the time and space in your tummy. My personal fav is cookies n’ cream, because who doesn’t love ice cream, Oreos, cake balls, and massive amounts of whipped cream? Want to know a secret? Athena’s monster milkshakes are only served on certain nights of the week, so check their Facebook page to find out when they’re up for grabs. The staff tells me it takes four hours to prep for monster milkshake night with the baking of extra cupcakes, cheesecakes, and brownies that top each creation. Sounds like time spent well! Frost Bite Tuscaloosa is located at 1914 University Blvd. Suite C in downtown Tuscaloosa. Photo: Waﬄe cone bits, caramel, a little pistachio, and a homemade sweet cream base make this Frost Bite creation worthy of your taste buds. Athena’s Bakery and Boutique is located at 16820 Highway 43 North in the Winn Dixie shopping center. Photo: Athena’s milkshakes include full-sized bakery treat items, like a tasty cake ball, a slice of cheese cake, a cookie, or a full-sized cupcake. The Baked Bear Tuscaloosa Do you ever crave ice cream sandwiches so messy you need a spoon, and so big you need a bowl? Me too. The opening of The Baked Bear in Midtown Village created a line around (and around) the building, and the crowds haven’t stopped. Patrons can make an ice cream sandwich with cookie flavors of their choice, brownies, and even doughnuts. If that wasn’t enough, you can choose from 13 different ice cream flavors for your sandwich, and they have tons of fun toppings to finish off your creation. If you’re not in the mood for something so intense, a scoop of ice cream in a cookie bowl, or a nostalgic root beer float, could be in your future. If you are in the mood for something extra sweet, The Baked Bear has you covered. Sheena’s tip for success is to always include sprinkles… because who doesn’t love sprinkles?! The Baked Bear is located at 1800 McFarland Boulevard in the Midtown Village shopping center. Photo: There’s no doubt why The Baked Bear is popular... a warmed-up cookie, brownie, or doughnut is the perfect ingredient for the most perfect ice cream sandwich. WOODBANK LANE Creating Stunningly Beautiful Planters for Summer Flowers By Kathryn Wilkerson Summer is in full swing here in the South! I have at least five mosquito bites to prove it, and the humidity gives my hair a life of its own as soon as I walk out of my house. It’s also the season for flowers, spending time outdoors, and, for DIY fans like me, it’s time for a project (or 10). Hi there! I’m Kathryn, and here’s a crafty idea for creating planters to help you enjoy your favorite summer flowers. It only takes a little time and a trip to your favorite home improvement store. Here’s what you will need: • Empty metal containers • White spray primer • Any color spray paint • Painter’s tape • Thin string or rope • Goof Off (Heavy Duty Remover) • A small drill Start by hanging on to a few empty containers you might otherwise throw away, like coffee cans, a Crisco can, vegetable cans, or cans for nuts. In the pictures, you’ll notice I’ve used 10.5 oz coffee cans. Soak the cans in water for about 10 minutes, and pull off as much of the label as possible. To get the remaining paper and the sticky residue off the cans, I used Goof Off. It’s a great product, and you can easily follow the directions on the label. I picked mine up at Lowes for just a few dollars. Next, drill three to five drainage holes in the bottom of each can, and add your potting soil and flowers. I chose tall ones, so the cute cans would show. Once you have the flowers potted and arranged, wrap the string around the middle of the stripe a couple of times, and tie a bow. The string adds another layer and texture. You could also do the reverse of this and have white cans with colored stripes. They’ll make the perfect table decoration for your outdoor summer get-togethers, pretty gifts for teachers, or a thoughtful hostess gift. Who doesn’t love flowers in a cute container? Photos: Kathryn Wilkerson Tuscaloosa native Kathryn Wilkerson is a wife, mom of three, a teacher, and the author of Woodbank Lane – a blog that offers up a variety of different decorating ideas and projects, recipes, and inspiration for living. Follow Kathryn at woodbanklane.com and on Instagram @woodbanklane. Live at the Plaza: Fridays in July, 6-9 p.m. Government Plaza, downtown Tuscaloosa. The City of Tuscaloosa is once again hosting musical acts as part of this series. The concerts are free, and the atmosphere is family-friendly. Bands playing this month include The Kemistry Project, Alabama Blues Project, Earl “Guitar” Williams, Corey Nolan, Plato Jones, Tim Few, and Sweet Home Symphony. Kids Clay Camps at Kentuck: Now through July 26, Kentuck Art Center, Northport. Registration is now open for July Kids Clay Camps at Kentuck. Classes for 6-8-year-olds and ages 9+, with multiple summer sessions. For more information, call (205) 758-1257 or email eskinner@kentuck.org. Super Shark Saturday at CHOM: July 21, 9 a.m.-4:30 p.m. Children’s Hands-On Museum, downtown Tuscaloosa. Learn about great white sharks, make your own “pet” shark, play shark-themed games, and listen to shark tales. For more information, visit chomonline.org or call (205) 349-4235. Independence Day Bash at CHOM: July 3, 9 a.m.-4:30 p.m. Children’s Hands-On Museum, downtown Tuscaloosa. July 4th Enjoy Civil Air Patrol demonstrations, activities, Zeigler hot dogs and lemonade (from 11 a.m. to 1 p.m.), crafts, games, and more – all included in admission. For more information, visit chomonline.org or call (205) 349-4235. Run 2 for T-Town: July 4, 7:30 a.m. NorthRidge Fitness, Northport. This fun, family-oriented, twomile race includes lots of prizes and giveaways, music, and watermelon. Applications are available at Wagner’s RunWalk and NorthRidge Fitness. Kentuck Art Night: July 5, 5-8 p.m. Main Avenue, Northport. This event is free to the public. For more information, visit kentuck.org/art-night. First Friday in Downtown Tuscaloosa: July 6, 5 p.m.- 8 p.m. This event is free to the public. Local galleries, businesses and restaurants are open as a way for the community to see what downtown Tuscaloosa offers. For more information, visit firstfridaytuscaloosa.com. Color Me Crazy at CHOM: July 7, 9 a.m.-4:30 p.m. Children’s Hands-On Museum, downtown Tuscaloosa. Design your own salt painting, create pointillism art, and test a lava lamp experiment. For more information, visit chomonline.org or call (205) 349-4235. 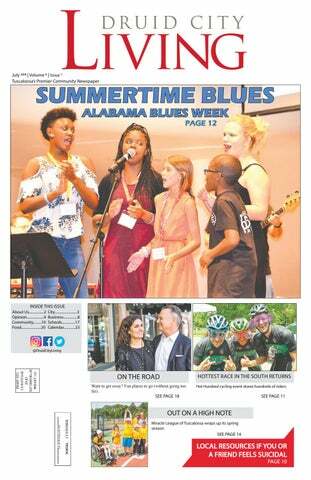 Alabama Blues Week: July 9-15. Events and classes are planned throughout Tuscaloosa, including Government Plaza, the Moody Music Building, and the Bryant Conference Center. Events include free blues performances, master classes and sessions led by blues and music industry musicians, as well as UA faculty. For more information, visit alabamablues.org Chamber Business After Hours: July 10, 5-7 p.m. Courtyard Marriott, Tuscaloosa. For more information, visit tuscaloosachamber.com. Bama Art House Films Summer Series Presents “The Death of Stalin”: July 10, 7:30 p.m. Bama Theatre, downtown Tuscaloosa. Box oﬃce opens at 6:30 p.m. For more information, call (205) 7585195 or visit bamatheatre.org. Theatre Tuscaloosa Presents “Once Upon a Mattress:” July 13-22, Bean-Brown Theatre, Shelton State Community College, Tuscaloosa. This funny and irreverent musical is Broadway’s retelling of “The Princess and the Pea.” Filled with songs, laughter, and romance, this is a summer musical for the whole family. For show times and to purchase tickets, visit theatretusc.com or call the Theatre Tuscaloosa Box Oﬃce at (205) 391-2277. Inspect Insects at CHOM: July 14, 9 a.m.-4:30 p.m. Children’s Hands-On Museum, downtown Tuscaloosa. Examine specimens from all over the world, make a bug hat, and decorate a bug. For more information, visit chomonline.org or call (205) 349-4235. Midtown Village “Screen on the Green”: Saturdays, July 14-Aug. 11, 8 p.m. on the Green at Midtown Village. This free summer film series features great kids’ movies. Bring blankets and lawn chairs and enjoy. 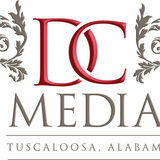 For more information, visit midtownvillagetuscaloosa.com. Bama Art House Films Summer Series Presents “The Insult”: July 17, 7:30 p.m. Bama Theatre, downtown Tuscaloosa. Box oﬃce opens at 6:30 p.m. For more information, call (205) 758-5195 or visit bamatheatre.org. Mr. Pig Goes to the Zone: July 20, 6 to 9 p.m. North Zone of Bryant-Denny Stadium. Proceeds from this annual event support efforts to improve quality of life for those diagnosed with cancer. Tickets: $25 ($40 for couples). Tickets are available for purchase at the door, local Piggly Wiggly locations, and online at eventbrite.com/e/mr-pig-goes-to-thezone-tickets-47152235606. Caregiver Café Summer Speaker Series: July 24, 6 p.m. Morning Pointe of Tuscaloosa (1801 Rice Mine Road North). This monthly educational seminar is “Caring for the Caregiver – Taking Care of You While Caring for Others.” For more information, call 205345-1112. Jason Aldean’s “High Noon Neon Tour 2018” with Luke Combs and Lauren Alaina: July 25, 7:30 p.m. Tuscaloosa Amphitheater. Tickets available via Ticketmaster.com. For more information, visit Ticketmaster.com, call the Tuscaloosa Amphitheater Box Oﬃce at (205) 248-5280 or charge by phone at (800) 745-3000. The ACT Presents “High School Musical”: July 27-29, Bama Theatre, downtown Tuscaloosa. For show times, visit TheACT.info or call (205) 3932800. 16th Annual Hot Hundred Bicycle Ride: July 28, UA Recreation Center, Tuscaloosa. The Hot Hundred is the sole fundraiser for the Tuscaloosa Mental Health Alliance (TMHA). Hundreds of riders are expected to participate in this century bicycle ride. For more information, including registration information, visit bikehothundred.com. Hogwarts Day at CHOM: July 28, 9 a.m.-4:30 p.m. Children’s Hands-On Museum, downtown Tuscaloosa. Design your own wand, create your house tie, adopt a magical creature, enjoy potions demonstrations, have a chocolate frog, and more. For more information, visit chomonline.org or call (205) 349-4235. Tuscaloosa Farmer’s Market: Tuesdays and Saturdays, 7 a.m.-noon. Tuscaloosa River Market, 1900 Jack Warner Blvd, Tuscaloosa. Shop for fresh produce, grass fed beef, baked goods, cheeses and more. Buy fresh, buy local. For more information, visit tuscaloosarivermarket.com or call (205) 2485295. Northport Farmer’s Market: Saturdays, 6 a.m. to noon, 4150 5th Street, Northport. For more information, visit npfarmersmarket.com.